The Best Educational Technology blogs from thousands of top Educational blogs in our index using search and social metrics. Data will be refreshed once a week. 2.16 Cool Cat Teacher Blog | Be a Better Teacher. Live a Meaningful Life. 2.40 Lightspeed Classroom Audio Blog - Lightspeed Technologies, Inc.
2.58 Reflections of a Techie | Reflecting on using 21st century technologies to amplify learning. Education Technology newsletter is a comprehensive summary of the day's most important blog posts and news articles from the best Education Technology websites on the web, and delivered to your email inbox each morning. To subscribe, simply provide us with your email address. Maine, USA About Blog FreeTech4Teachers.com is a blog that Richard started in 2007 as part of PD course that Richard took with the Great Maine Schools partnership. He now conduct PD workshops, speak at conferences all over the world, write about educational technology, provides free resources and lesson plans for teaching with technology for the teachers. Facebook fans 445,650. Twitter followers 109,484. Canada About Blog Educational Technology and Mobile Learning blog provides all the tips, tutorials, and guides that you need to effectively integrate technology in your teaching. Facebook fans 140,828. Twitter followers 30,903. Dallas, TX About Blog The Shake Up Learning Blog by Kasey Bell offers educational technology and digital learning resources, tips and tricks, tutorials, Google cheat sheets and more to educators across the globe. Facebook fans 7,934. Twitter followers 55,499. Westchester, NY About Blog Emerging EdTech is one of the Internet's fastest growing Education Technology resources. Kelly aims at engaging students and enhancing learning outcomes with Internet & instructional technologies. Facebook fans 9,603. Twitter followers 9,697. NY, CA and elsewhere About Blog Our mission is to provide cutting-edge news, emerging technology trends, practical tips and best practices. Every issue strives to help administrators manage, teachers teach, and students learn. Facebook fans 9,908. Twitter followers 56,740. On Campus About Blog ProfHacker delivers tips, tutorials, and commentary on pedagogy, productivity, and technology in higher education. Facebook fans n/a. Twitter followers 23,076. Silicon Valley About Blog EdSurge is an independent education technology information resource and community. Find K12 and HigherEd Edtech News, Research, Jobs, Products and Events. Facebook fans 25,166. Twitter followers 120,000. Boston, MA About Blog EdTechTeacher is an educational technology, professional development provider dedicated to helping teachers use technology to transform their classrooms. Their mission is to help teachers and schools leverage technology to create student-centered, inquiry-based learning environments. Facebook fans 8,193. Twitter followers 27,204. Washington, DC About Blog Our mission is to partner with the global education community to enable student and institutional success, by leveraging innovative technologies and services. Facebook fans 12,803. Twitter followers 37,031. Fresno, CA About Blog Alice Keeler is Author 50 Things You Can Do With Google Classroom, her blog and a certified google teacher. Teacher Tech is a website created by her on educational topics such as Google Classroom, Google Apps, 3D printing, coding, common core, and teaching in the 21st century. Facebook fans n/a. Twitter followers 123,637. New Delhi, India About Blog Eckovation is India's fastest growing social learning platform and one stop destination for quality learning. We currently have over 1000 quality educators, 5000 learning groups and 700000 learners on our platform. Read about Machine Learning, Blockchain, Robotics, IoT, Drones and much more. Facebook fans 24,045. Twitter followers 352. Maryland About Blog eSchool News connects you to the latest on how today's K-12 educators are using technology in the classroom. It is your daily source for technology news and innovation in education. Facebook fans 8,220. Twitter followers 80,104. Irvine, CA About Blog EdTechTeam is a California Benefit Corporation and global network of educational technologists dedicated to improving the world’s education systems using the best technology and learning principles available. Facebook fans n/a. Twitter followers 38,680. San Diego, CA About Blog Learn how to use technology, common core and reading to create better learning opportunities for your students. Find new ideas and tips for teachers who use technology in the classroom. Facebook fans 18,844. Twitter followers 2,280. 16. Cool Cat Teacher Blog | Be a Better Teacher. Live a Meaningful Life. Facebook fans 14,937. Twitter followers 158,178. New York About Blog A Teacher Vetted Educational App Resource and Review site... Because not all educational apps are created equal. Facebook fans 3,648. Twitter followers 23,128. New York About Blog Monica Burns is an Curriculum and EdTech Consultant, Apple Distinguished Educator and Founder of ClassTechTips.com. She started ClassTechTips.com to provide a resource for educators and administrators on implementing EdTech in the classroom. Facebook fans 6,982. Twitter followers 49,695. Philadelphia About Blog TeacherCast is designed for both the seasoned teacher who is searching for some great resources as well as the teacher who is a unsure how to start incorporating newly developed 21st-Century skills. They are here to help you get to know the latest websites and apps that are driving today’s classrooms. Facebook fans 1,508. Twitter followers 25,360. Maine, USA About Blog Richard Byrne, at Practical Ed Tech, has been teaching teachers to teach with technology. Facebook fans n/a. Twitter followers 108,027. Bloomington, IN About Blog The Ed Tech Roundup is your source for regular updates on the latest educational technology news & reviews. They also have a growing library of lesson plans and resources to help classroom teachers integrate technology across the curriculum. Facebook fans 1,076. Twitter followers 5,603. California About Blog Ask a Tech Teacher is a group of tech ed teachers who work together to offer you tech tips, advice, pedagogic discussion, lesson plans, and anything else they can think of to help you integrate tech into your classroom for education. Facebook fans n/a. Twitter followers 7,218. Facebook fans 2,814. Twitter followers 13,422. Cambridge, MA About Blog The Mimio Customer Care Team works with teachers and administrators to make Mimio reading program implementation as easy as possible. Facebook fans 4,955. Twitter followers 2,769. Fort Wayne, IN, USA About Blog K12 educational transformation through technology. Interests in topic 21century skills, PBL, STEM, & NETS. Facebook fans n/a. Twitter followers 13,509. New York, NY About Blog Welcome to the Time To Know blog, where we write about all topics pertaining to Ed-Tech and eLearning, whether for publishers, K-12, higher-ed, vocational, or corporate. Facebook fans 4,629. Twitter followers 829. Saline, MI About Blog This blog is intended to give helpful tips and tricks for incorporating technology into your classroom. Facebook fans 4,677. Twitter followers 1,385. About Blog The mission of EdTech Digest is to tell the story of 21st-century education transformation. By sharing cool tools, fascinating interviews, relevant trends and voices from the field, the team hopes to inspire learners and leaders everywhere, to get workable technology solutions for education widely known about and well thought of. Facebook fans 919. Twitter followers 36,156. Clover, SC About Blog Instructional Technology Integration Specialist, STEM Leader, Consultant & Speaker, Apple Distinguished Educator, NBCT, PolarTREC Teacher. Facebook fans 137. Twitter followers 3,742. United Kingdom About Blog Education Technology is the only publication that covers the ICT developments that are relevant to the entire education sector from primary schools to universities. It is the definitive resource for technology news, reviews and features. Facebook fans 1,010. Twitter followers 14,491. Facebook fans 32,258. Twitter followers 23,270. Brooklyn, NY About Blog News, updates, and ed tech tips straight from Flocab HQ. Flocabulary is a learning program for all grades that uses educational hip-hop music to engage students and increase achievement across the curriculum. Teachers at 20,000 schools use Flocabulary’s standards-based videos, instructional activities and student creativity tools to supplement instruction and develop core literacy skills. Facebook fans 39,195. Twitter followers 11,163. Coeur d'Alene, ID About Blog The mission of NCCE is to lead, engage and assist educational communities to reach higher levels of student and educator success through the use of 21st Century technology. Facebook fans 1,871. Twitter followers 4,189. Sanborn, NY About Blog Celebrating 25 years of business, Studica is the Education Source for Software and Technology Products. We are the premier value added reseller of software, computer hardware and music technology for educators and students. Facebook fans 14,325. Twitter followers 858. About Blog Fractus Learning is a global team of expert educators, leaders, makers and creators working passionately to share the best techniques, tools and toys for meaningful learning. With a focus on students and family learning, Our goal is to be the single best place for finding amazing techniques, tools and toys to spark a life full of fascination, curiosity and learning. Facebook fans 2,211. Twitter followers 5,781. Facebook fans 905. Twitter followers 1,138. 40. Lightspeed Classroom Audio Blog - Lightspeed Technologies, Inc.
Tualatin, OR About Blog Read articles from educational thought leaders on the evolution of the 21st Century classroom. Understand how technology is improving the listening and learning environment for students and teachers. Facebook fans 1,116. Twitter followers 783. Winston-Salem, NC About Blog Blogging About The Web 2.0 Connected Classroom blog provides information with blend of technology and education. As a former classroom teacher and Director of Instructional Technology Steven is highly sought after for his expertise in educational technology integration and using social media for learning. By Steven W. Anderson. Facebook fans n/a. Twitter followers 161,371. Chicago, IL About Blog A pioneer in the field of educational social networking, Dembo was among the first to realize the power of blogging, podcasting, Twitter, and other Web 2.0 technologies in connecting educators and creating professional learning communities. Facebook fans n/a. Twitter followers 26,614. Michigan About Blog An Educational Technology Blog that focuses on integrating tech into the classroom. Nicholas Provenzano also provide professional development for school districts. Facebook fans 1,468. Twitter followers 57,506. Colorado About Blog iLearn Technology started as an edublog about technology in learning. It has expanded into ezines and curriculum for 21st century learning. Facebook fans 3,104. Twitter followers 18,332. Portland, Oregon About Blog We design and build solutions to improve the process and practice of teaching and learning. Follow for news, events and blog updates. About Blog Serving up steaming scoops of K12 edtech observation, thoughts, and opinions. With gravy. On HotLunchTray I provide insights on educational technology, teacher professional learning, and fresh opinions on education. Ontario, Canada About Blog My name is Gavin Middleton and I have been a business and information technology teacher for over 10 years. My mission is to inspire educators to teach with and about technology. Facebook fans n/a. Twitter followers 498. San Francisco, CA About Blog StudyAce is a San Francisco, California-based corporation focused on learning games. The company’s mission is to create engaging experiences that improve students’ success. This platform synthesizes years of student and instructor interviews, expertise in curriculum and game design. StudyAce uses learning games, flashcards and practice tests to improve students’ comprehension of course materials. Facebook fans 71. Twitter followers 1,143. Connecticut, USA About Blog David Andrade is an Educator and an Educational Technology Specialist. was an engineer for 10 years before changing careers and becoming an educator. He has ver 10 years in the classroom and 2 years in educational technology administration. His blog is a resource of educational web tools and mobile apps for teachers and educators. Facebook fans n/a. Twitter followers 4,785. About Blog A boutique consultancy providing strategic research and counsel on issues at the intersection of education, public policy, technology, and innovation. About Blog Zig Zagging Through Education & Technology shares insights and experiences about working with young students to integrate technology in ways that challenge their thinking. Facebook fans 146. Twitter followers 2,938. About Blog On Virtual School Meanderings, Assistant Professor of Instructional Technology and Education Evaluation & Research Michael Barbour shares distance education resources and ponders ideas on the effective online delivery of material to K-12 students in virtual and cyber classrooms. Mumbai About Blog A blog about the ways that educational technology can transform teaching and learning. My blog reflects my thoughts and wonderings as an educator, a tech director, and R&D core team member. Sydney, Australia About Blog Hey Jude helps educators navigate the rapidly changing landscape in search and social networking and provides insights into preparing students for a digital world. Facebook fans n/a. Twitter followers 9,316. McKinney, TX About Blog Blogging about brain-based teaching, technology integration, and classroom resources. By Diane Dahl. Facebook fans n/a. Twitter followers 3,233. 58. Reflections of a Techie | Reflecting on using 21st century technologies to amplify learning. About Blog Evaluating instructional strategies, integrating social networking, digital conversations and technology in middle school math, science, reading, and social studies. Hawkesdale, Australia About Blog Immersing technology in the classroom and beyond into the globe! Facebook fans n/a. Twitter followers 6,397. Chicago, IL About Blog A blog about teaching and learning as an Instructional Technology Coach. Facebook fans n/a. Twitter followers 2,214.
oklahoma About Blog E-Learning Queen focuses on distance training and education, from instructional design to e-learning and mobile solutions, and pays attention to psychological, social, and cultural factors. The edublog emphasizes real-world e-learning issues and appropriate uses of emerging technologies. Facebook fans 17. Twitter followers 297. London Ontario About Blog Derek is a curriculum designer and professional development creator & facilitator. His goal is to engage and empower students about their passions through Coding, Making, and Inquiry. Subscribe to get the latest updates from this blog in your inbox. Facebook fans n/a. Twitter followers 3,464. About Blog A resource sharing blog for educators to help bring web 2.0/21st Century tools to the classroom and bridge the gap between education and technology. Northbrook, IL About Blog Ideas and Resources for K12 Educators. Apple Distinguished Educator Lucy Gray is an education technology and social media consultant. Facebook fans n/a. Twitter followers 39,534. New Delhi, India About Blog Learn about websites, APPs and technologies that let you learn whatever you want--become a millionaire, see the world, discover the secrets of the world and beyond! The EdTech Post offers news, reviews, and user guides on education technology products, software and services to educators, students and developers. Singapore About Blog Edu-(Tech)niques is the blog by Hong Kong-based K-5 Instructional Technology Coordinator Colin Gallagher, who describes introducing kindergartners to iPods using colorful cartoon icons, conducting his own Twitter survey of teachers and tech integration, and facing challenges that come with being a school’s tech position pioneer. Facebook fans n/a. Twitter followers 2,575. Shelby County district of KY About Blog Education technology resources, tool tips, and general "thinkalouds" of a Digital Learning Coordinator. About Blog Education & Tech provides education news, expert tech advice, reference articles, and social media tools for educators, administrators, parents and k-12 students. Facebook fans 120. Twitter followers 173. Liberty-Benton - Findlay, OH About Blog Over the past two decades Alvin Trusty has worked in every facet of educational technology. He has taught at both the high school and university levels. He has been a school district and regional administrator, and has represented the state of Ohio as a creator of educational technology professional development. Facebook fans n/a. Twitter followers 3,412. Facebook fans n/a. Twitter followers 7,455. Michigan About Blog Pam Shoemaker is the Instructional Technology Coach for Walled Lake Consolidated Schools in Michigan. She is a Google for Education Certified Trainer. Pam serves on the MACUL Board of Directors and is on the Leadership Team for the ISTE EdTech Coaches PLN. Topics that may be included in this blog include ed tech ideas and trends, teacher leadership, instructional tools & educational research. Facebook fans n/a. Twitter followers 9,163.
elmhurst, IL About Blog A blog about technology in education and designing spaces for learning. Facebook fans n/a. Twitter followers 1,500. Facebook fans 757. Twitter followers 8,073. About Blog Weevur is a platform designed to empower every person around the world by facilitating skill and knowledge exchange. Our mission at Weevur is to make quality education more accessible to people around the world. Facebook fans 28. Twitter followers 75. About Blog Technology Integration Specialist. Passionate about learning fueled by technology. Goal: create connected, global learning communities for adolescents in which they feel a higher sense of purpose for their lives. About Blog Analyzing the intersection of education and technology. When education intersects technology, exciting potential quickly emerges. At times, however, hype outshines value. Only through careful analysis can the best decisions be made about how the skillful use of technology might best improve both teaching and learning. Facebook fans n/a. Twitter followers 5,901. Salinas, CA About Blog This is a blog of educational technology tips and tricks set up for any teacher, TOSA, instructional coach, or school district, but especially those who are using a GAFE (Google) domain. All are welcome to comment, share, and avail themselves of the resources on this blog. Facebook fans n/a. Twitter followers 5,926. Lier, Norge About Blog Experiences, thoughts and reflections on education and technology - digital school. About Blog Classroom Technologies is a comprehensive technology solution provider, focused on helping educational institutions operate at the highest level of technological efficiency and fiscal responsibility. With decades of combined educational industry experience, we know and understand the environmental constraints and current obstacles that our school systems are facing today. About Blog The Doucette Ed Tech Blog will address new educational technologies and how to embed them into a classroom setting. We follow blogs, websites, journals, and suppliers of educational technology in order to write about the most important and most useful innovations. About Blog Observations by Gary E. Miller. For the past four decades, I have been involved in media-based distance education at Penn State and the University of Maryland University College. I am a 2010 Sloan Consortium Fellow and a 2004 inductee into the International Adult and Continuing Education Hall of Fame. CONGRATULATIONS to every blogger that has made this Top Educational Technology Blogs list! 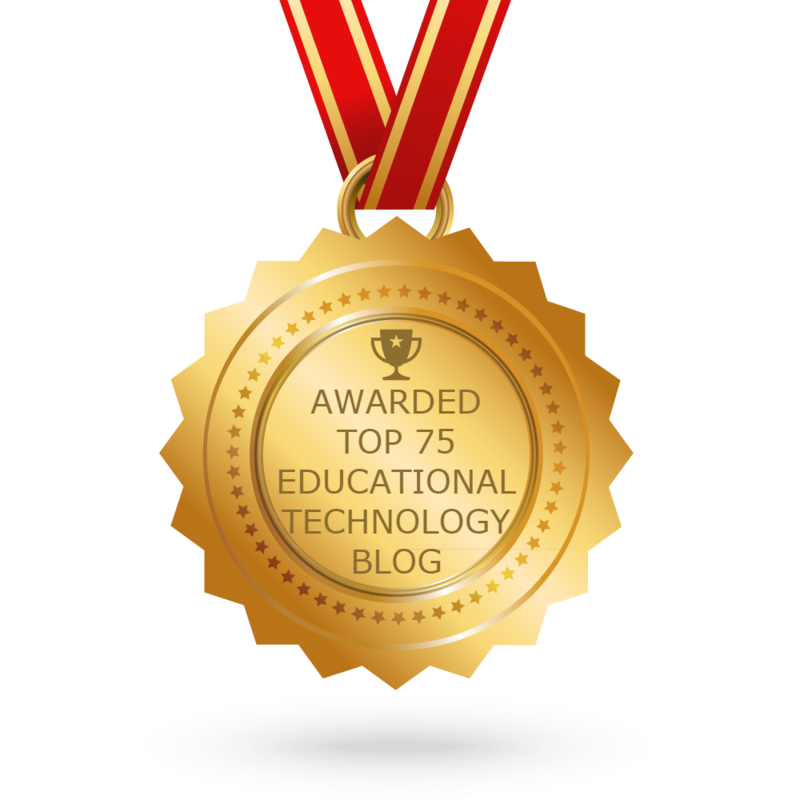 This is the most comprehensive list of best Educational Technology blogs on the internet and I’m honoured to have you as part of this! I personally give you a high-five and want to thank you for your contribution to this world.